Collecting fine art isn't just for the rich anymore. Everybody desires a home that reflects their personality and is aesthetically pleasing. And people from all walks of life desire to leave a legacy for those they love. The Collector's Plan is a purchasing tool that empowers you to obtain exquisitely crafted fine art which retains and appreciates in value. With a monthly investment amount that you determine, you will begin building an "art savings account." Over time your account reaches an amount great enough to collect the artwork you desire from the full Mulfinger collection. You may order on-line, or please, pick up in person. When it arrives at home, you have the assurance of having made a wise investment that is visually appealing. 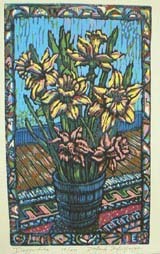 An original Mulfinger linocut over the buffet will add essence to your dining room. Your family will enjoy a sumptuous oil painting while sitting in front of the fire. An inviting batik will welcome your guests with you in the foyer. Investing wisely in fine art isn't just for the rich anymore. Now anyone can collect masterful artwork that will appreciate over time. And unlike a savings account, your investment comes with the added bonus of being enjoyed by you and all who see it. To join in on the Collector's Plan see details below. To purchase artwork, walk-in appointments are available upon request; via email: mulfingerartstudio@yahoo.com or by calling (864) 895-5244. Monthly payment options: PayPal and Visa preferred. Checks and Money Orders accepted. Automatic withdrawals from checking account is supported via PayPal. Check payment: To arrange a Check or Money Order Payment, please email or call us.